It is a fact that the foods we eat can significantly influence our heart health. The problem is that everyday we are bombarded with new information about what constitutes a heart-healthy diet. It is a fact that the foods we eat can significantly influence our heart health. The problem is that everyday we are bombarded with new information about what constitutes a heart-healthy diet. The following steps offer a simple and practical approach to achieving a heart-healthy lifestyle. • Increase healthy fats — Essential fatty acids (EFA) are the healthy fats that protect our bodies from degenerative diseases, such as heart disease. Omega-3 fatty acids, which help reduce inflammation and lower blood pressure, are found in flaxseed and flaxseed oil, walnuts, Brazil nuts, and fish such as salmon, fresh tuna and sardines. • Reduce unhealthy fats — Eliminate animal products and high-fat dairy products from your diet. Eliminate foods that contain hydrogenated and partially hydrogenated fats. Unhealthy fats are found in almost every commercially baked and processed food, margarine and most fried food. • Reduce refined carbohydrates — Refined carbs include bread, pasta and baked goods, all of which are high in sugar. High blood sugar elevates insulin, which is linked to increased cholesterol, triglycerides, blood pressure and heart disease. • Eat more veggies — Packed with nourishing vitamins, minerals and antioxidants, fruits and vegetables are good for your heart. 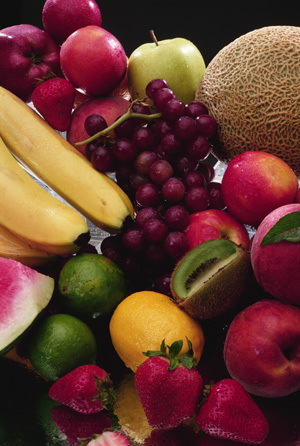 Try eating one fruit or vegetable of each color every day. • Drink more tea — High in flavonoids, green and black teas protect the heart, mainly due to their antioxidant content. • Enjoy red wine in moderation — Studies show that regular, moderate consumption of red wine enhances heart health and maintains normal cholesterol levels. • Get moving — Exercise strengthens the heart, lowers the pulse and blood pressure, reduces stress, lowers blood fats, raises HDL “good” cholesterol and improves our moods. Whether its walking, yoga, riding a bicycle, dancing or swimming, regular exercise has incredible health benefits. • Make small changes — Set a goal to eat at least one healthy meal each day, until you develop a habit of eating healthy at every meal. How do you know if you are at risk for heart disease? Your naturopathic doctor can perform a comprehensive cardiovascular blood test assessment. This test not only checks your total cholesterol, triglycerides, LDL and HDL, but also checks your CRP (c-reactive protein) and homocysteine levels. These new blood markers have been shown to be more accurate in assessing true heart disease risk than cholesterol levels alone. Dr. Toni Vaughan is a naturopathic physician in practice at the Acupuncture & Integrative Medicine Center in downtown Phoenix. She practices naturopathic family medicine with emphasis on chronic lung and heart conditions. www.AIMcenterAZ.com, drvaughan@aimcenteraz.com or 602-265-1774. ← Do you know if your antioxidants are working?